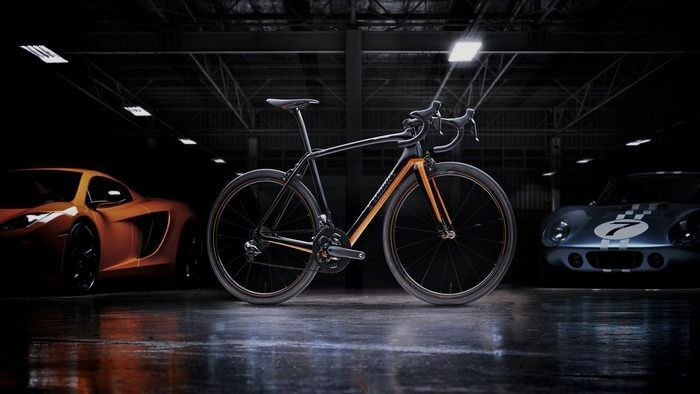 US bike firm Specialized has unveiled its McLaren S-Works Tarmac bicycle, the fruits of a joint labour effort with McLaren Automotive - and it costs a staggering £16,000. The carbon-fibre two-wheeler was created by McLaren using high-tech data simulations that tested the limits of the bike before it even went into production. McLaren used the aforementioned software to help develop its F1, Super, and Hypercar designs, meaning this bicycle has some serious engineering oomph at its core. The bike was based on the latest version of the S-Works Tarmac bicycle, and sports some unique features compared to its forebear. "Our design benchmark, the new S-Works Tarmac, was already a very, very efficient structure to start with," says Joe Marsh, composite design engineer at McLaren. "The McLaren uses 300 percent more high-modulus fibres in its construction, reducing material and therefore weight. We've also used more than 500 unique carbon-fibre ply shapes in the construction - that's 300 more than the standard S-Works." The result is an super-strong bike frame that weighs in at under 6kg, plenty light to drag about on the tubes. It's got a particularly extreme looking black-and-orange paintjob too, courtesy of McLaren's Woking-based paint-team, the same crew that sorted out the finishing coat on McLaren's six-figure P1 Hypercar. 'Okay, so I've sold my car and various other worldly belongings. How do I get one?' Right, well there's actually only 250 of these being made, which didn't sound too bad until Specialized announced just ten of the bikes will land in the UK. You can register to get one at Specialized's website, and if you luck out then they'll invite you to undergo a 'Body Geometry fit session' where the team will tailor the bike's shape and size to fit you perfectly.